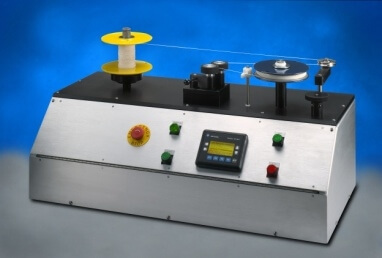 This Winder is used to wind fiber, tubing, wire or other material from a supply spool onto a target spool or guide. Its primary use is in winding erbium doped fiber amplifiers (EDFA) but it can be used to remove material from a supply spool and deposit it onto anything that can be held by the take-up shaft. 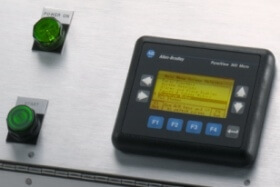 The winder starts and stops automatically to transfer the length set on the operator panel. The fiber or wire is guided back and forth across the target reel so it lays in a tightly packed manner. The wind parameters (speed, length, pitch and target reel height) are set through the operator panel. An encoder on an over-center pinch roller tracks the wound length and prevents reverse flow by use of a one-way clutch. The wind tension is maintained by a spring-loaded dancer and is adjusted by rotating a mechanical knob. The pinch roller tracks the transferred length even if material is pulled off by-hand at the beginning or end of the wind. The material can be cut to load a new target reel and the one-way clutch in the pinch roller prevents loosing the free end. Target reel turns can also be tracked and controlled. This winder combines multiple production features into one tabletop package that is easy to set up and adjust. Once the process parameters are set, a wind can be repeated by pushing the RUN button. Waste is minimized as the process is precisely controlled and all material usage is tracked.